As Loulou from Here I am Loulou says, sometimes there is just not enough day in the day! I know exactly what she means! I think that’s been my thought for the day, every day, this week. 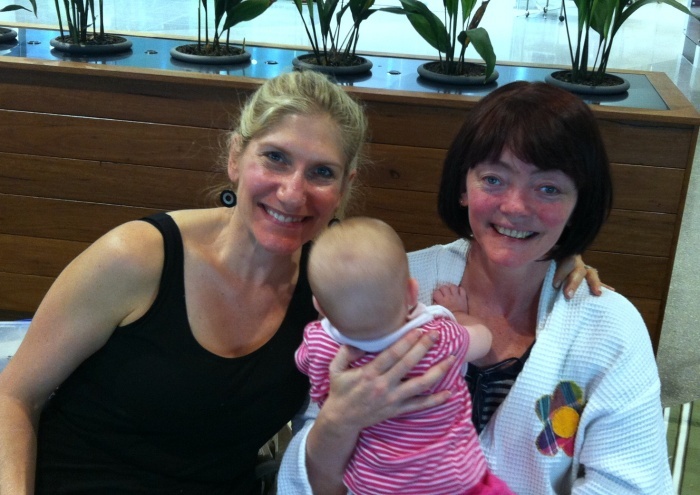 My friend Belinda came to Sydney for a hospital appointment and ended up being admitted. It was a bit of a surprise, especially to Belinda and her husband Nathan, but there have been a whole lot of positives. 1. First off and most importantly, Belinda can get the treatment she needs a bit sooner than expected. It also means she has to rest up which will help her heal more quickly. I don’t think Belinda has the word “stop” in her vocabulary. 2. I thought I was going to have dinner with Belinda on Tuesday. And I did. It wasn’t quite the restaurant feast we were all imagining. If Belinda couldn’t come to the restaurant, I decided to take the restaurant to Belinda. But this was no ordinary take away, it was food from home; prepared in my trusty thermomix, transported in my nifty thermoserver and served at the bedside. Not bad for my first attempt at outside catering! Home cooked beats hospital cooked every time – it’s cooked with love and full of flavour. My beef risotto really hit the spot! 3. As the hospital is around the corner, I also get to see Belinda every day and have a proper catch up. Geography hasn’t been kind to us and the 160km distance means we don’t get to hang out very often. Lucky for us our friendship doesn’t depend on us being together. Still, the quality time we have had is a real bonus. 3. I finally get to meet Belinda’s beautiful baby. She is so gorgeous just like her mum, and her dad! It’s taken 7 months for us to finally meet face to face but it was well worth the wait. 4. I’ve never had a better excuse to get busy in the kitchen. Thanks to my trusty thermie, I’ve been on a bake a day! There’s the Chocolate Brownies, Donna Hay’s Orange Yoghurt Cake, Chocolate Orange Fridge Biscuits and Double choc chip cake with chocolate frosting. Now I have a thermomix, I am like a bionic baker. Weirdly, I can see my lead lined “radioactive” room from Belinda’s hospital window! It just makes me realise how every cloud has a silver lining, ain’t that so? Phew! Writing this all down makes me realise how super busy I’ve been. And inbetween all that, I’ve been thankful at Thanksgiving, been to a thermomix cooking class, been wiped out with a migraine, won myself an ebook and celebrated my anniversary. What a week! I think I’ve just realised the easy way to have enough day in your day, is to put less in, get more out! I’m still learning, that sometimes, less is more!